The crowd goes silent around the 18th green at St. Andrews as he lines up a putt to win the Open Championship. The walk across the Swilcan Bridge crossing the 18th fairway was just as iconic as he imagined. The only sound are the waves from St. Andrews Bay that runs parallel to the Old Course. The moment he has been waiting for his whole life is right in front of him. Will he make history and get his name on the Claret Jug? 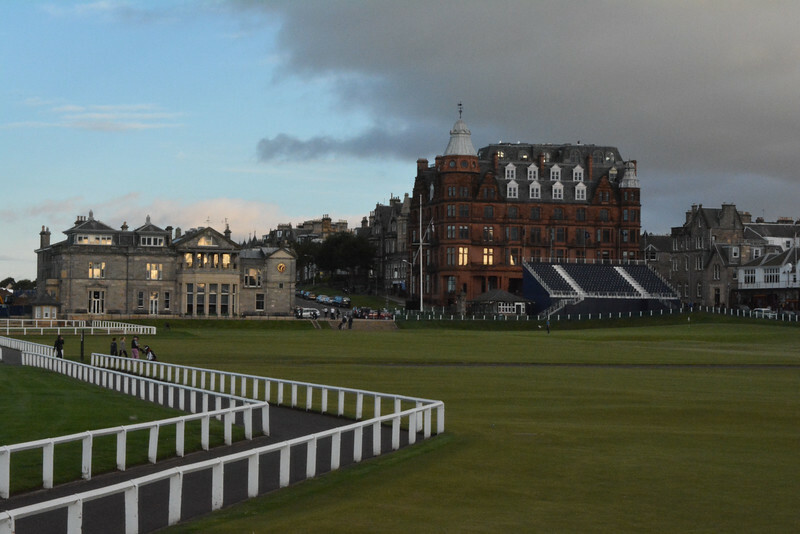 Don’t worry, if you are not at all interested in golf, St. Andrews is much more than just a famous golf course, though I will admit that as you stroll around the town centre, pretty much the focal point of everything is golf related. I will share with you a couple of reasons why you need to experience this gorgeous part of Eastern Scotland. I have visited St. Andrews on three separate occasions now but our most recent trip was during the Ryder Cup 2014 weekend at Gleneagles. 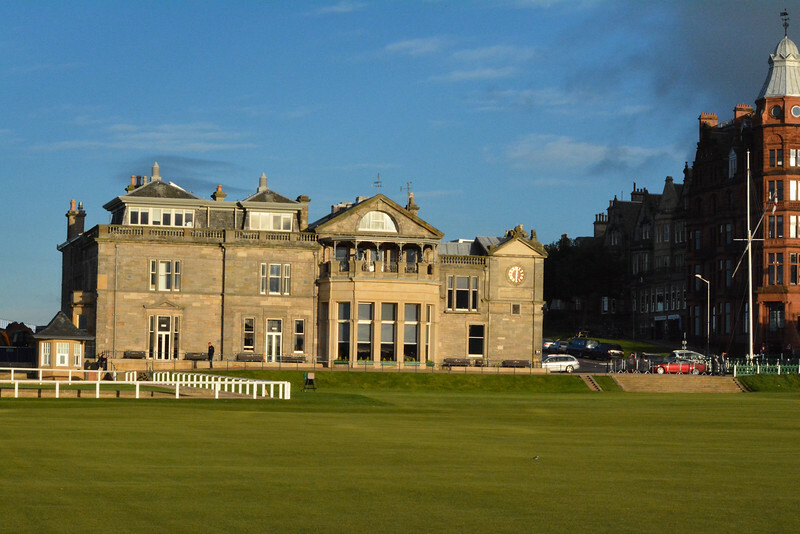 St. Andrews is located about 40 minutes from Gleneagles and I am sure many of the American supporters decided to pay a visit to the Home of Golf along with many other tourists. If you are an avid golfer like myself, you can probably relate to that short introduction. That is exactly what was running through my mind as I stood on the 18th hole at the ‘Home of Golf’. St. Andrews is the ultimate destination for any golfer around the world. Golfers flock here daily to add their name to the ballot to hopefully get the opportunity to stride around the most famous course in the world of golf. Although I have yet to play this prestigious course (I have every intention of changing this! ), just setting foot on the hallowed turf is enough to get the goosebumps tingling in the back of your neck. We arrived at the Old Course just before sunset and this proved to be a perfect opportunity to see a few of the late starters finish their rounds along with capture a few memorable pictures of the Old Course Hotel, Clubhouse and of course ‘the links’ themselves! The first thing you notice at St. Andrews when you step on the first tee is just how wide a target you have to aim for. All of the 1st and 18th fairways are merged together so you can’t miss the fairway right? Well, I am sure when you step on that teebox for the very first time the target is probably a little smaller than you imagine as a spectator. Beware of the Swilcan Burn though with your tee shot because on those St. Andrews links, the ball just keeps running and running. We walked down the side of the 1st fairway to the green before crossing over to the iconic Road Hole bunker by the 17th green and looking back towards the 18th hole and clubhouse. What a stunning view – that’s pretty much all I can say! If you are not impressed by this view, you are not a true golfer. Even if golf isn’t your thing, I am sure you will appreciate the beauty of the natural landscape around St. Andrews and the surrounding Bay. Take a stroll along the beach and you will be astounded by the stunning scenery that makes up this part of Scotland. It is no wonder that the origins of golf date back to here because they certainly picked a great part of the world to find our beloved game! Do you know anyone who has attended St. Andrew’s University? I personally have a friend who went to university there but I am sure you are probably not thinking of him, rather one of the most famous individuals not only in England but throughout the world – Prince William! Prince William loved the town of St. Andrews so much that he decided this was the best fit for him to study Geography and earn a Scottish Master of Arts degree. 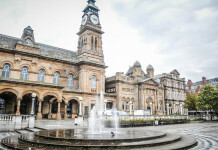 When you walk around the relatively small town centre, you will see why this would be a perfect fit for royalty. The agreement was made with the media that they would leave him alone for the four years he was studying and by all accounts they kept their promise. Of course, this was also the institution attended by Kate Middleton and the place where the two first met. The University of St Andrews as it is officially known, dates back to the early 15th Century and you can certainly see this by the architectural design of the campus buildings. For the American readers out there, it is unlike any American campus or even many British university campuses as when you walk around the town at first you probably are not aware that you are at the heart of a college campus. Some of the most iconic buildings on the St. Andrews campus include St. Salvator’s Quad, University Hall (both of which are residence halls) and St. Salvator’s Chapel which sits behind the quad. Walking around you will likely see many buildings that are affiliated with the university, ranging from the administrative sections to the student union and halls of residence. If you are able to experience St. Andrews while university is in session, just take a moment to see all of the students walking back and forth to classes or popping in to the union for a bite to eat! Trust me, the student’s are likely to be easily identifiable. 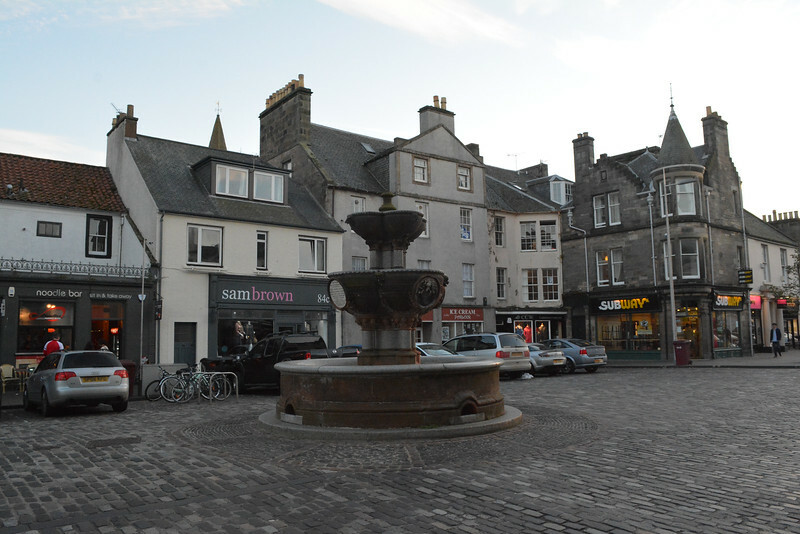 St. Andrews main centre is divided into three main streets that run parallel with each other – North, South and Market Street. 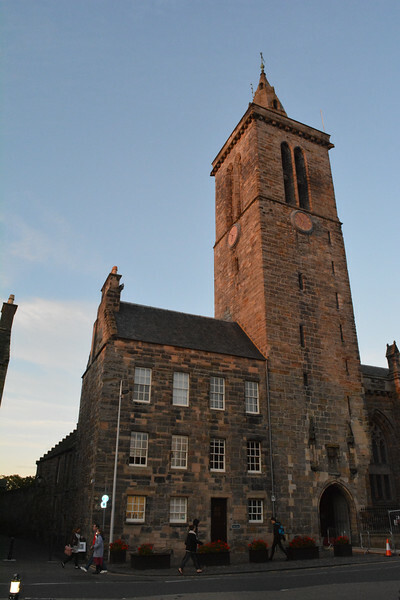 Much of St. Andrews University is situated in close proximity to North Street so it is no surprise that much of the buildings you see along here are affiliated with the institution. But it is still really cool to walk down and see the history that has unfolded here. 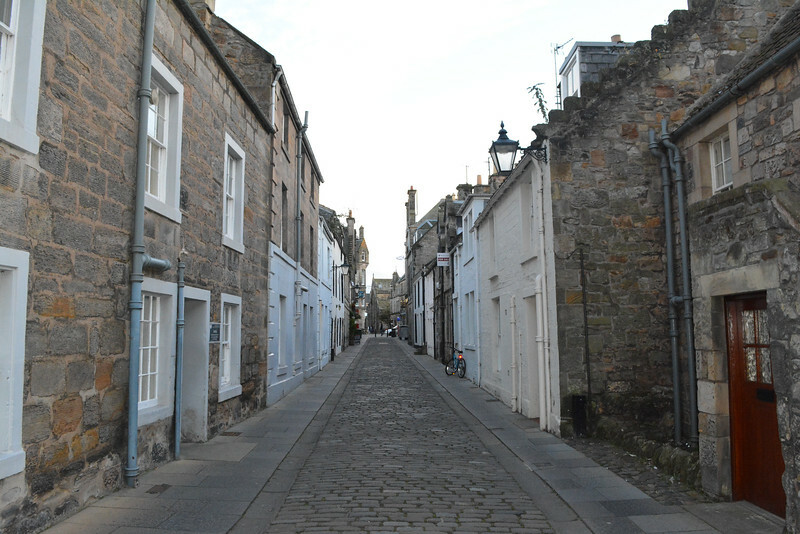 We walked from the Old Course along Golf Place and then headed down North Street taking in the historic buildings before cutting along one of the cobble stoned streets to get to Market Street. This is where you will see many of the modern day stores such as Starbucks, Tesco Metro along with a variety of restaurants and local establishments that cater to tourists and the student population. South Street is the next street down from Market Street so feel free to just wander around and take in some of the local shops or sample some stereotypical Scottish cuisine at the cafes here. St. Andrews in my opinion will always be about golf, but that’s probably because I am biased! I love visiting this part of Scotland because of the golfing history that has been made here. Having our picture taken on the Swilcan Bridge is definitely a memory I will cherish as the likes of Jack Nicklaus and Arnold Palmer have had their pictures taken similarily here! If you are planning on visiting Scotland any time soon, add St. Andrews to your must-see list of places to visit. It’s only a hour from Edinburgh and a little more from Glasgow, so it is easily accesible from the main Scottish hubs. Thanks, St. Andrews University in particular is steeped with history and gorgeous architecture! That picture with the famous bridge and water… what is that in the foreground? Is it something for retrieving golf balls from the water? Well we all have to start somewhere Paul 🙂 You are correct with the identification of the golf ball retriever. Honestly, you don’t see this very often on golf courses with burns/lakes/water hazards but I guess with the frequency of balls heading in there and the cost of playing the Old Course, they are at least giving you the opportunity to to not lose your golf balls! I saw on your instagram feed you were there during the Ryder Cup tournament. How exciting that must have been. My husband is going to St. Andrews in the fall and as a non-golfer, i’ve been trying to decide if I should tag along with the group. Looks like there is lots to take in for both groups. Great info. 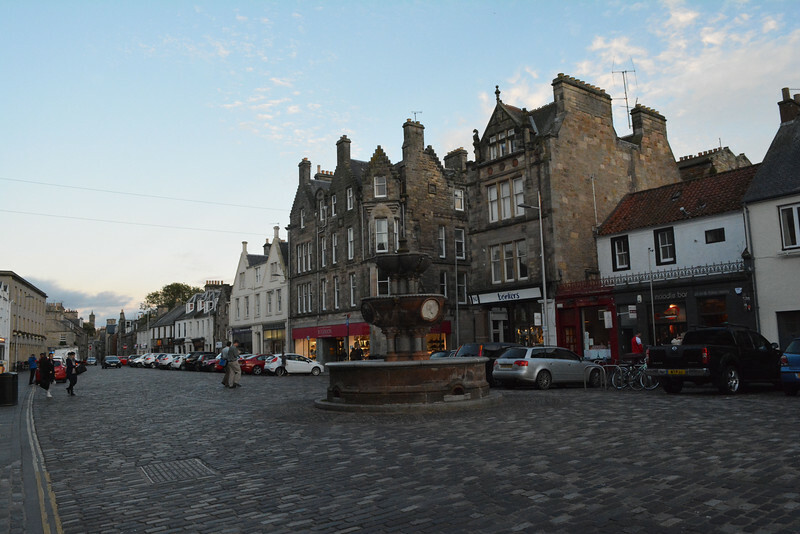 I think you would definitely find something that interests you Alison in St. Andrews, even if it just involves getting out and walking around exploring the historic town! Thanks for the kind comments! My teenager did a 3 week summer abroad program at St. Andrews when she was 15 and loved it there! She lived in the same residence that Prince William did in his first year and she felt fairly certain from some comments that were made that she had his room but couldn’t confirm it. I would love to return with her for a visit! That’s a pretty cool claim to fame especially if its true that she had the same room as Prince William! Either way just being affiliated with the same residence hall would be enough for me 🙂 Hopefully you will get to this part of Scotland to see for yourself! My husband is practicing his short game in our living room right now and while I don’t play that well, we certainly share your passion for golf. I so enjoyed learning more about St. Andrews and this historic course, it’s beautiful! How many days would you need to explore St. Andrews if you were planning a side trip from one of the other Scottish Hubs you mentioned? Daidri, you could easily explore St. Andrews on a day trip from either Edinburgh or Glasgow but it really depends on if you plan on venturing further north from there to Dundee and then on to Aberdeen and the northern parts of Scotland. That’s the beauty of Scotland, that there are so many cool places to explore. Aww, this looks like such a lovely place. I love these kinds of town. I din’t play golf… at all, but just being there, sipping tea and having cake sounds like a good plan too. Awesome! Visiting (and golfing) St.Andrews is on my to do list. 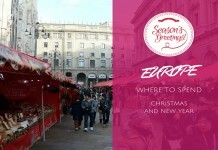 Hope to give it a go next year! Look forward to hearing all about your experience there! I will add that there are 7 courses in the St. Andrews links and even if you are not able to play the Old Course, all of the others are awesome courses worth playing! Ah the European vs USA divide 🙂 LOL, no not at all! Heather was actually cheering on Europe so it was a win-win situation for me! Plus it was never really going to be a contest, the Europeans dominated! Nice comparison you made there by the way and I have to agree with you. Sounds like a lovely part of the world that I would love to visit myself one day. You’ve some fabulous photos here, especially the sunset (or is it sunrise) and the last photograph is stunning. Thanks Kathryn, it was early evening so we were able to capture those sunset pictures! 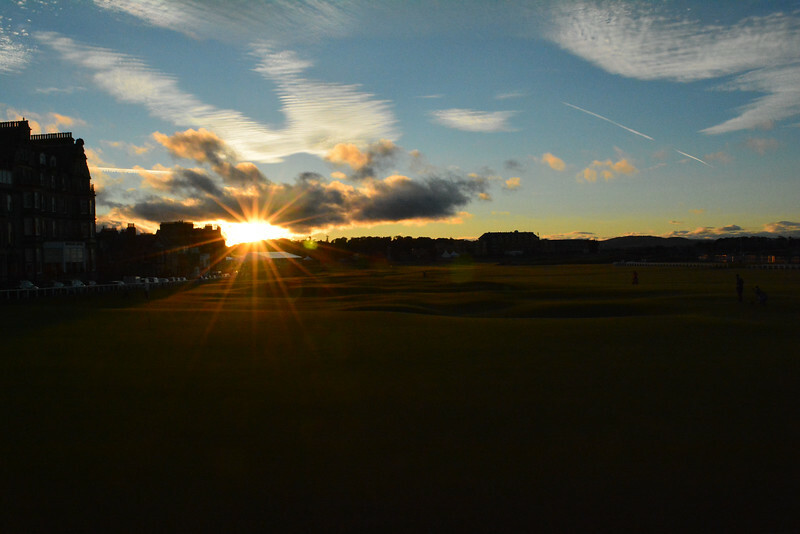 For an avid golfer like myself, capturing the sun setting over the 18th at the Old Course at St. Andrews was a memory I will cherish for a while. It really is beautiful to just walk around St. Andrews even if golf isn’t your favorite pastime. While I’m not a golfer by any means, I would love to explore this Scottish town! It looks wonderful. Justin loves golfing and would really like to visit here! 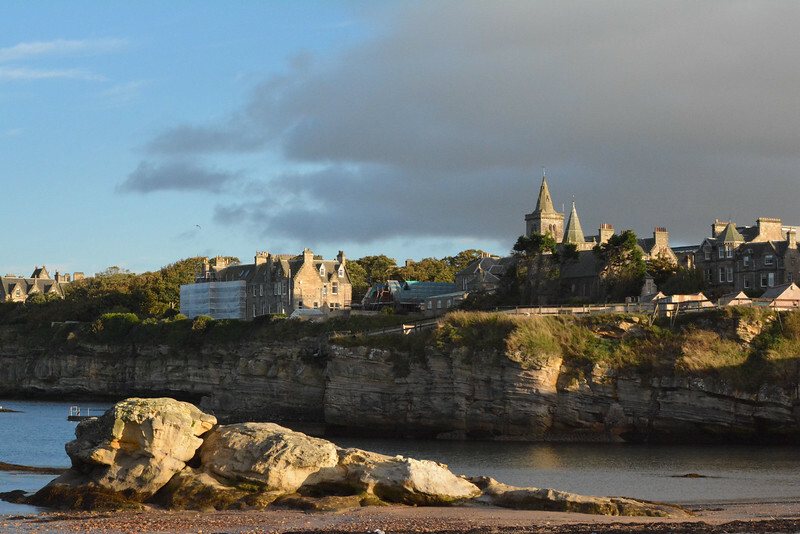 St. Andrews is just one of many towns worth exploring along this part of Scottish coastline. Justin would love this part of the world, plus there are a whole host of ‘cheaper’ courses so there is something for everyone here! A golfer’s dream for sure! Although I’m not a golfer, St. Andrews sounds like a lovely town that I’d like to visit. I can’t imagine how cool it would be to study at a University that looks like that! Scotland is on my bucket list. I hope to make it there one day. St. Andrews looks like a lovely town to visit. Lol I know St Andrews as the place Wills & Kate went to University 😀 No idea it was the home of golf! I’m not much of a golf fan, but even I have heard of the legendary St. Andrews. It looks like such a lovely place to explore, even for people like me who aren’t into golf. Does visiting while school is in session add to the ambiance or does it get super crowded? I’m definitely more interested in the town than the golf course- sorry Chris! Golf just reminds me of wet sunday’s being dragged around a course with my Dad and brother as a teenager. I’ve never tried golf before (only pitch and putt) but would love to try one day. It’s probably not fast paced enough for me but it would be good for relaxation. And you’re outside, which is always a plus, too. The buildings surround look very impressive! 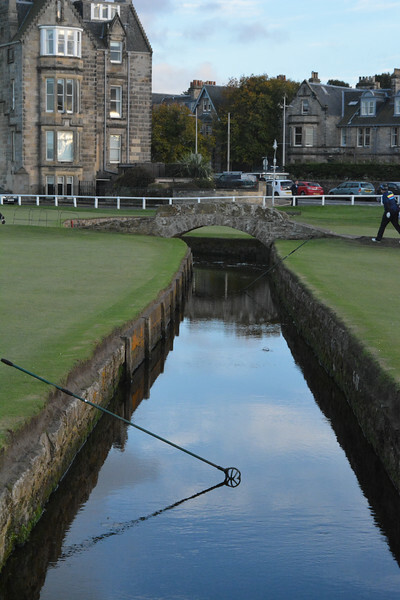 I think golf is the most boring sport ever, but I would probably make an exception for it in St Andrews. I remember my grandfather (a Golf enthusiast) telling me about St Andrews and I always thought I’d play a game for him there, even though I cant really play. Love the honest Margherita about golf being your favourite (sorry, that’s what I thought you said!) sport 🙂 St. Andrews is a gorgeous part of Scotland worth exploring even if golf doesn’t interest you!